While Wonder Bread CBS keeps trotting out its tired “We need to do better” mantra, FX and now HBO in fact have done notably better this season by African-American creators and performers. FX’s Atlanta is star/show-runner Donald Glover’s singular view of the inner city black male experience. 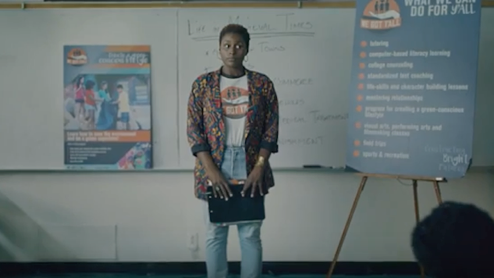 HBO’s Insecure, premiering Sunday, gives voice to Issa Rae in a comedy drawn from her Awkward Black Girl web series. The women of Insecure are far more prosperously employed than Glover’s featured characters. Their co-workers are largely white, and the series errs at times in caricaturing them in ways that likely would be branded insensitive if the reverse were true. Rae, as 29-year-old Issa Dee, is particularly at the mercy of pasty-faced white dweebs with nary a clue -- save for co-worker Frieda (Lisa Joyce) in fits and spurts. They all work for We Got Y’All, an inner city L.A. outreach program with a “Constructing Bright Futures” motto. These kids aren’t outwardly grateful, though. Instead they’re slingshot artists. When Issa urges them to never settle for less, a girl rejoins, “Her outfit settled for less!” Everyone howls and Issa is mortified. Her best friend, Molly (Yvonne Orji), is a considerably bigger earner as a lawyer in a prosperous firm. Molly’s pad is palatial compared to Issa’s. But landing a man has been a steep uphill climb, with Molly collecting and discarding them almost night by night while Issa continues to live restlessly in the nondescript Dunes apartment complex with her nice guy, but unemployed boyfriend Lawrence (Jay Ellis). Atlanta and Insecure both drop the n-word with complete abandon, which I’ll probably never see as completely necessary. But the banter among black characters does flow freer as a result. And in all seriousness, who cares what white TV critics think about its propriety? Some of Rae’s best moments during the six episodes made available for review are when her character squares off with herself in a mirror and rehearses what she should or shouldn’t say in big moments. Episode One ends with what she actually does say during an impromptu night club rap whose go-to words are another way of underscoring a va jay-jay in need of repair. Insecure also finds Issa in a triangle and a quandary after old boyfriend Daniel (Y’lan Noel) reenters the picture. None of the main African-American male characters are scoundrels, pimps or abject womanizers, which is refreshing. HBO, as did FX, needed to take these next steps toward diversification of prime-lineups that had been mostly whites-only clubs. HBO’s ongoing Ballers is something of an exception, although its star, Dwayne Johnson, is not its author as well. Both Insecure and Atlanta are notable for executing the singular visions of their black creators. Issa Rae, with Comedy Central’s recently deposed late night host, Larry Wilmore, acting as co-captain, has a voice that very much deserves to be resoundingly heard at length. “Being passively aggressive is what I do best,” her character says near the outset. Insecure proves to be anything but.